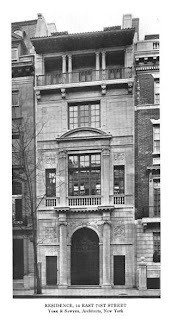 The William W. Cook residence designed by York & Sawyer c. 1912 at 14 East 71st Street in New York City. Cook was an attorney and author of the book Cook on Corporations. Click HERE and HERE for more on the Cook residence. Click HERE to see the house on google street view. 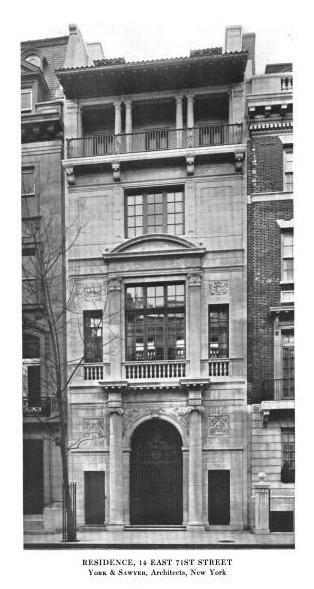 Photo from Annual Exhibition of the Architectural League of NY, 1914. I think the "Duty Free" magnate lives here now. The Jello-promoting funny man owns No. 18. The Victoria Secret "buddy" lived in the mansion across the street, but I think he's still in prison for White Slavery. This is a great favorite of mine---interesting how York & Sawyer pulled it all together, and what depth and interest the loggias provide.